Here’s another cutie pie whom I’ve had the pleasure of photographing since she was just a few days old! She is too cute! 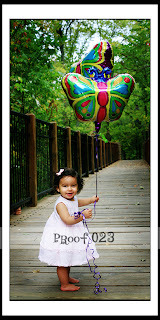 And here she is with her butterfly balloons at the park, enjoying the day! It shows her personality and her beautiful smile. I love it.